Everything you need all in one Free-weight Package. 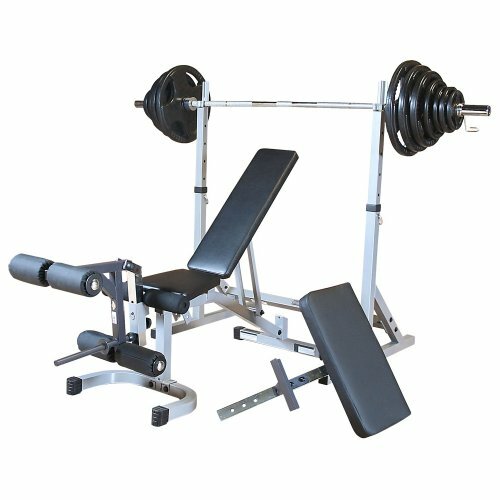 The PSSPACK2 comes with the PSS60X Squat Rack, PFID130X Adjustable Bench, GLDA1 Leg Developer, GPCA1 Preacher Curl attachment, and 300lb Rubber Grip Weight Set. Solid and stable, this Press Rack holds the bar safe and secure with the heaviest of weights. Bar supports feature height adjustments from 30 inches to 60 inches for doing Flat, Incline and Decline Bench Presses, Squats, Curls, Upright Rows, Shrugs, Calf Raises and much more! This entire package fits comfortably in a 7' x 7' room or larger. Note that this product is designed and warranted for Home Use Only. PSS60X Squat Rack adjusts from 30" to 60"
Powerline In-Home Only Ten Year Warranty on Frame. 1 Year on all other parts.